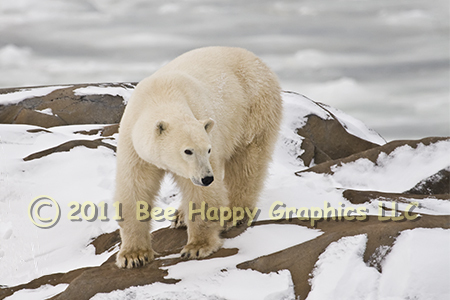 This is the same bear as in the Resting Polar Bear image. It was taken three minutes later, when the bear got up to stretch and patrol the coast. 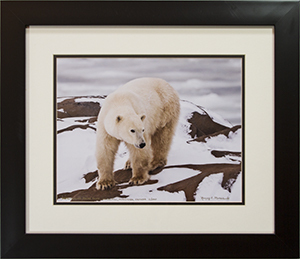 In 2008, the U.S. Department of the Interior listed the polar bear as Threatened under the Endangered Species Act. 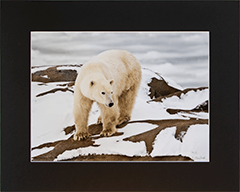 Experts are concerned that if the sea ice continues to decline in the Arctic due to climate change, two-thirds of the world’s polar bears could vanish in another forty years. Photographic details: Canon EOS 30D camera w/ EF 100-400mm f/4.5-5.6L IS USM lens set at 400mm. Flash was not used. Camera was set for f/6.3 on aperture priority with +11/3 stop exposure compensation, resulting in a shutter speed of 1/250 sec at ISO 800. Fine Art Paper 11" x 14" 12" x 18"
Canvas N/A 16" x 24"